We live in a very interesting time where data and information is at our arms length. Consuming it, comprehending it and making appropriate business/life decisions is a choice we make almost every day. Some of these choices we are present to and some of these we are not. You might or might not be familiar with the frameworks I am about to unpack in this article. Now before I do that, let’s assume we are familiar with concepts such as the Sharing Economy, Conversational Commerce, etc. If you’re not, no dramas – have you heard and used services such as Uber, Airbnb, Slack, WeChat, Line, WhatsApp, FB Messenger? If your answer is a yes, congratulations you’re part of the sharing and conversational economy. If your answer is a no, where have you been hiding and what have you been doing — I am curious, please let me know (LMK) @pkrasam. Now let’s unpack the frameworks. How to future proof your idea, yourself and/or your business ? 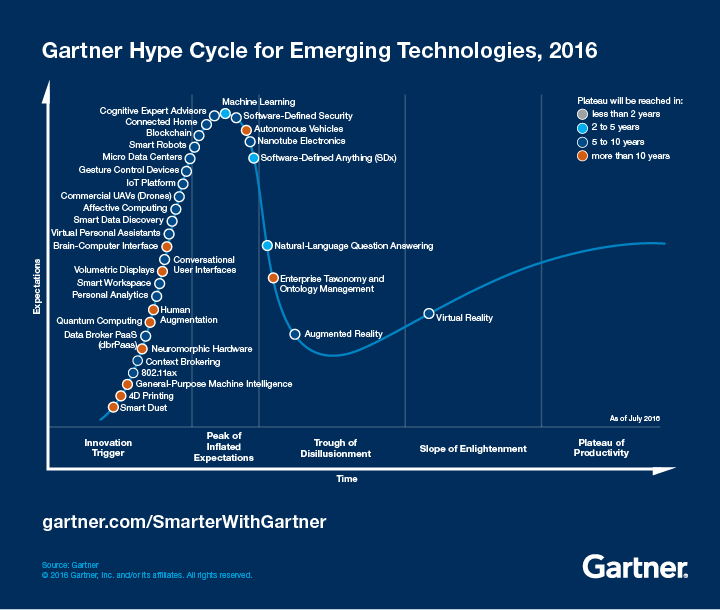 Now there are several frameworks, tools and methods available to pick from and we are choosing the ‘Gartner Hype Cycle’ which comes with a graph depicting the journey : technology trigger, peak of inflated expectations, trough of disillusionment, slope of enlightenment, and plateau of productivity — said differently maturity to adoption. Plus the graph gives us a preview of how they are solving real business problems and unlocking new opportunities. Did I mention the graph has a Time dimension typically spanning multiple horizons (H1, H2, H3) of company. I want you to take a minute and map where your idea, you, your business to the various technologies listed above. If you have managed to find a home, that is awesome. You’re in a good trajectory and potentially have a higher propensity of still being relevant, so long as you continue to experiment and unlock new commercial opportunities. On the other hand, if you didn’t find a home, don’t be alarmed, there is help on its way. You just need to have a conversation with someone who knows or understands this space to help you navigate this space. Most often I use this framework to check how relevant I am to the market, what new skills should I pick up and what new commercial opportunities our startups can unlock. I want to leave you with some examples of the kinds of startups and founders we get the privilege to work with on a daily basis. As a bonus all of the examples listed below are mapped to a technology on the graph above and they are well onto unlocking opportunities and commercialising them. Button (Conversational User Interface & Natural Language Question Answering) : Quick reply buttons for Slack messages. HowAboutEat (Virtual Personal Assistant) : How about lunch delivered to your office? Say “Yes” to $1 lunch delivery. Othera (Blockchain & Smart Contracts) : Redefining the way financial services providers minimise risk and increase leverage of credit and asset backed securities. ResponSight (Software Defined Security) : Security monitoring that learns what doesn’t belong. SafetyCompass (Augmented Reality) : Real time, location specific safety for frontline workers through augmented reality. SpaceConnect (IoT Platform & Smart Workplace) : Real-time space management through ambient intelligence. I hope to have left you inspired and introduced you to a new way of future proofing your idea, yourself and/or your business. Should you have any further questions, comments, feedback …I welcome them and please get in touch. This article was first published on BlueChilli.